Take a trip to the past and experience colonial life first-hand. 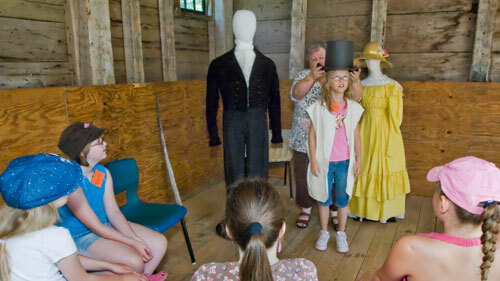 This program includes an interactive house tour, outside walk , costume talk, and colonial games. Please book your class trip early to avoid disappointment. Both pre-visit and post-visit activities are available. Upon arrival, students will be directed to the Carriage House where they will receive an orientation to the site. The Costume Talk is the first program activity, and will be presented to all the students at once while in the Carriage House. It will introduce the students to colonial life as they observe and participate in a demonstration of male and female clothing that would have been worn 200 years ago. The students will then be divided into groups that will rotate between the remaining three activities. Each group participates in all components of the program. While touring the house, students will focus on the lives of families in the 1800s. They will examine artifacts relating to family life and engage in discussions as to how technology has changed and why family life has both changed and remained the same over the last 200 years. To experience pastimes of children in the early 1800’s, students will get to try their hand at various toys and games that were popular in colonial times, such as stilt walking, rolling hoops and graces. The Uniacke Estate grounds tell a social studies story, with interesting aspects of landscape as well as unique features that were introduced. As students explore the grounds and study colonial methods of travel, they will be able to discuss and see evidence of why Richard John Uniacke chose to build his home here, and how his family interacted with nature.